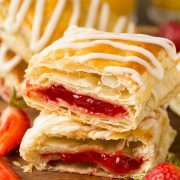 Strawberry Cream Cheese Breakfast Pastries – A simplified, perfectly tasty pastry recipe! Made with flaky layer of store-bought puff pastry, creamy, tangy sweetened cream cheese and fresh strawberries. Who wouldn’t love these? Who loves the holidays? Insert raising hand emoji here because I seriously love them! But let’s be honest, really I just love all the holiday themed foods! Holidays only come about 10 times a year so it’s fun to have a day of splurging with delicious treats and butter/cheese/cream heavy entrees and sides, because who’s counting calories on Valentines – not me! Not that I really count anyway but I do try to watch what I eat. 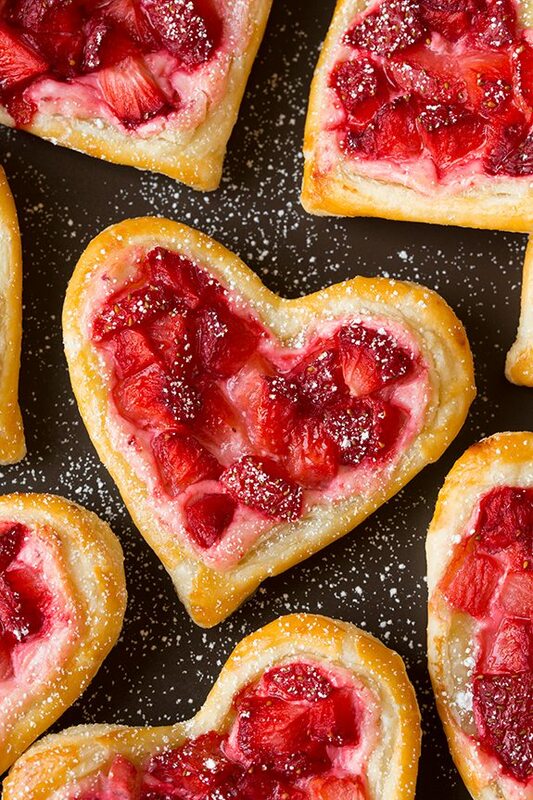 These puff pastry hearts are the perfect breakfast or brunch treat to give to any of your friends or loved ones. 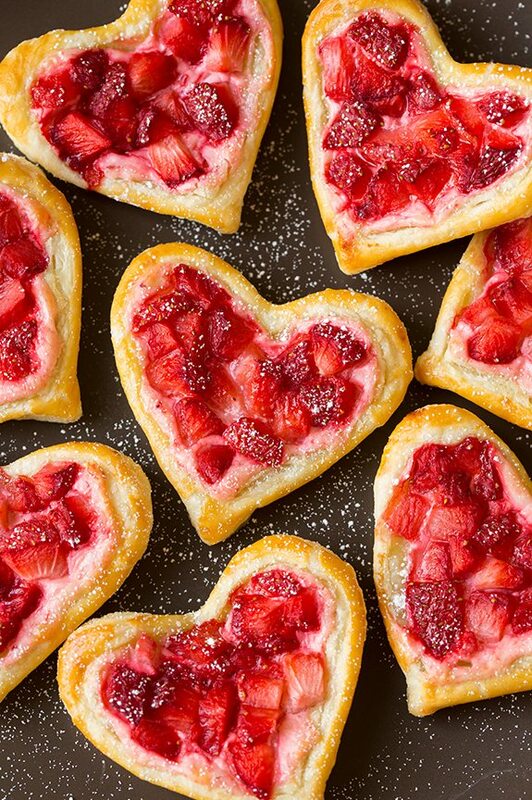 Yes, they do take a little more effort then your typical dessert that uses a store bought puff pastry but they are so worth it – especially because of those pretty heart shapes and lovely red and pink colors. Really they aren’t so much time consuming as it is steps, like and waiting for pastry to thaw, cutting out and scoring the dough etc. 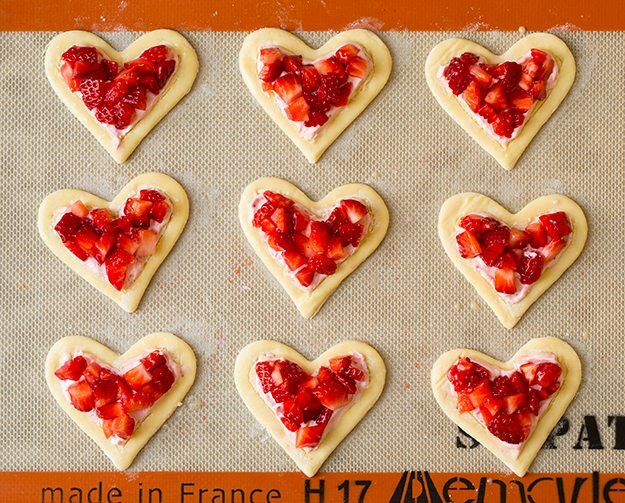 Of course if you want to cut back on those you could just cut out 6 rectangles and slices the strawberries (vs dicing them into little pieces) which will go a little faster than the hearts. Or better yet, make them well worth your time and just double up the recipe. If doing so just start thawing one pastry about 15 minutes after the other since you don’t want to fully thaw it to room temp before baking. And as a side note, just so you aren’t expecting a really sweet dessert, know that these are more mildly sweet than some of the typical pastries and pies you may be used to (just be sure not to use a low-sugar jam here or they won’t have enough sweetness). I like them this way though as it leaves room for the flavor of the strawberries to shine, it also make it reminiscent of cheesecake which isn’t overly sweet either. 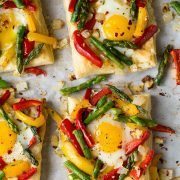 And can we ever get enough of that flaky puff pastry? Never. 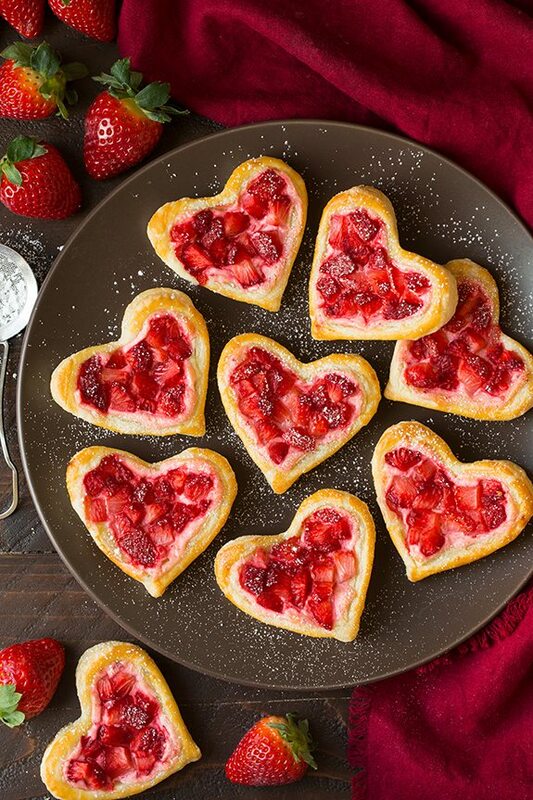 I hope all of you have a fun Valentines day and may it be full of delicious Valentines day inspired treats! A simplified, perfectly tasty pastry recipe! 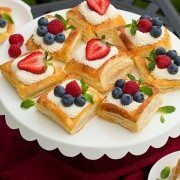 Made with flaky layer of store-bought puff pastry, creamy, tangy sweetened cream cheese and fresh strawberries. Who wouldn't love these? Thaw puff pastry according to directions on package and halfway through thawing preheat oven to 400 degrees. While puff pastry is thawing, in a small bowl and using a rubber spatula, mix together cream cheese, jam and food coloring while pressing mixture along bottom and sides of bowl to smooth large lumps. Transfer to refrigerator until ready to use (so it's not runny, you can flash chill in freezer if you prepared this near the end of the pastry thawing). 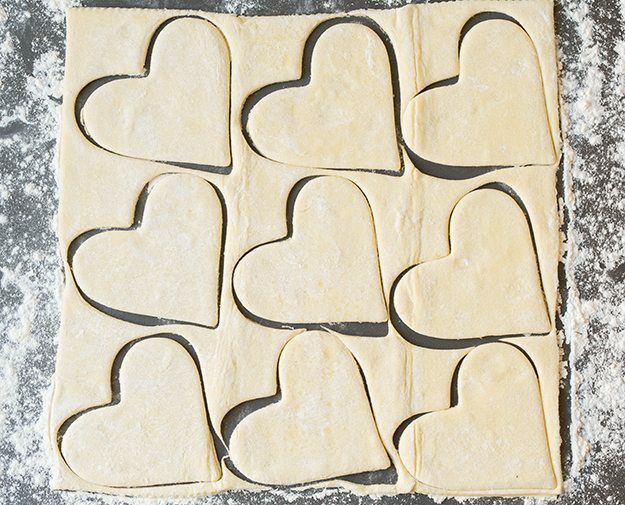 Cut pastry into heart shapes using a 3-inch heart-shaped cookie cutter (space them as close together as possible so you can get as many as you can out of the sheet). 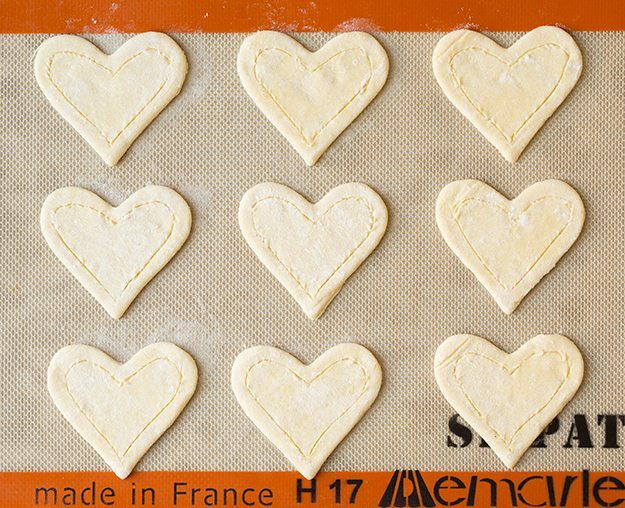 Transfer hearts to a baking sheet lined with a silicone liner or parchment paper, spacing 1 1/2-inches apart. 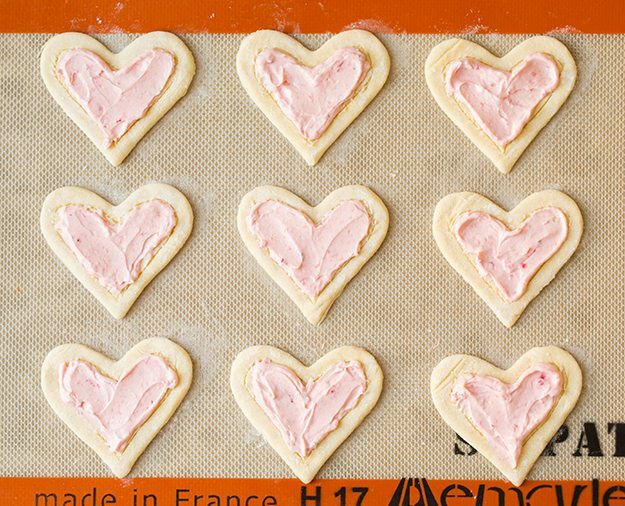 Using a sharp pairing knife, lightly score a heart inside of each cut-out heart coming about 1/3-inch from the edge, without cutting entirely through bottom of the dough. Add 1 tsp of the cream cheese mixture to center of each heart then spread outward without covering the 1/3-inch edge. Add strawberries over cream cheese layer, again without covering the edge. Using your fingertip brush the 1/3-inch edge with egg/water mixture. Bake in preheated oven 14 - 15 minutes until edges are golden brown. Let cool on a wire rack then dust with powdered sugar. Serve the day they are prepared.